This inspection evaluates the Home Office's progress towards implementing the 2 recommendations made in the Chief Inspector's July 2017 report. 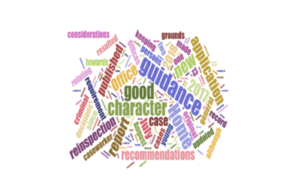 My original inspection report looking at the Home Office’s application of the good character requirement in the case of young persons who apply for registration as British citizens was published in July 2017. It made two recommendations, both relating to published guidance. Both were accepted and the Home Office committed to publishing updated guidance by the end of December 2017. The re-inspection began in August 2018, at which time the good character guidance had not been updated. New ‘Nationality: good character requirement’ guidance was finally published on 14 January 2019. My re-inspection report provides a chronology of the Home Office’s progress towards implementing the original recommendations, together with its explanations for the delays, and an initial readout on the new guidance. Since the latter appears, in large part, simply to restate the previous policy, albeit with more explicit references to its application to children and young persons, it is hard to see why it should have taken the Home Office so much longer to publish it than it had indicated. Moreover, the new guidance fails to address the question of caseworker discretion as I recommended, except in the most general terms, although the process change in September 2018 that requires decisions to refuse on good character grounds to be authorised by a ‘senior caseworker’ should go some way towards this. As well as the guidance, the re-inspection also looked at its application. My report examines the 28 cases between 13 July 2017 and 30 August 2018 where a child applicant was refused citizenship on good character grounds. In each instance, the refusal was based on the applicant’s criminal history. According to Home Office records, in the majority of cases the offence was one that most people would regard as serious. However, most resulted in a caution rather than a criminal conviction. Inspection of the case records found that, in general, the standard of record keeping was not commensurate either with the complexity of the cases or the significance of the decisions. It was telling that the Home Office informed inspectors that without carrying out a case by case review it could not provide examples of applications made since 13 July 2017 where considerations of the child’s ‘best interests’ had outweighed the good character considerations set out in the guidance and resulted in the application being granted. The re-inspection report was sent to the Home Secretary on 31 January 2019. It contains two ‘new’ recommendations, the first relating to the close monitoring of the effects of the new guidance, and the second relating to better record keeping of all the factors that have been considered in reaching a decision. The Home Office has “accepted” my first recommendation and “partially accepted” the second. In each case, it has set out what it plans to do and by when. In light of the previous delays, I will be keen to check that it sticks to its timetable. Meanwhile, I find its argument for only partially accepting the second recommendation weak and too passive. It may be true that including the child’s voice is not a mandatory part of the citizenship application, but if the Home Office is not going to interact directly with child applicants it still could and should do more to reach out to the responsible adult or guardian and ensure that they provide as much information as possible in support of the application, including the child’s view.